We’re getting very close to that “magical” day of April 3 when you can go to your local Apple store and get an iPad, or when the UPS man will bring one to your doorstep. More than ever, I’m excited about the iPad and am very much looking forward to calling one my own. Why? I have my reasons. Here they are. I have a first generation Kindle. I use it once in a while, and when I do use it, I love it. 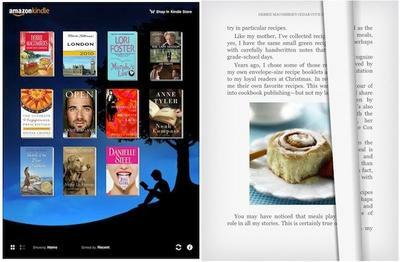 Using an eBook reader is like new-school tech combining with old-school reading. Today, you’ve got many more choices than you did two years ago if you want an eReader. And starting April 3, you will have yet another. I was waiting eagerly for Amazon to announce that they’d have an app for the Kindle, and it finally happened. This means that I can treat my iPad like a Kindle…I can access all of the books I’ve already bought (about twenty or so, or around $200 worth), and I can rely on Amazon to provide new and interesting features to make my reading experience better than what I can get through a Kindle device. But this is all assuming that Apple approves the Kindle app for iPad in the App store. They’d be crazy to reject it. If they reject the Kindle app, they’ll also be rejecting the forthcoming Barnes and Noble app. These rejections would cause a lot of anti-Apple sentiment and surely harm the success of the iPad. 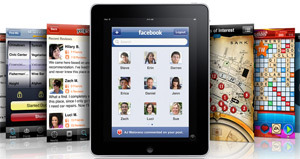 …and they’ll probably be available for iPad as a standalone app. Print publishing is dying. 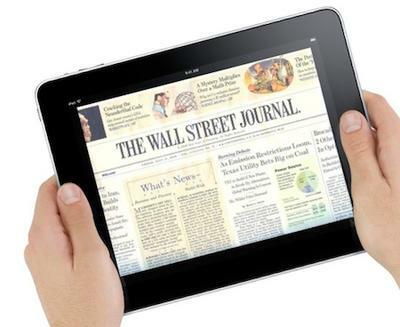 The iPad, and other tablet devices, will save print. Reading a magazine on an iPad will be unlike anything you’ve ever experienced. You’ll get the charm of “flipping” pages and seeing full-color images and fantastically formatted pages, coupled with the cool tech integrations like live video, hot linking for “further” reading, interactive advertisements, and interactive content. The same goes for newspaper. The content will become more easily accessibly as you can just simply tap on a headline in the index and be zipped off to the story. No more papercuts. Hooray. And by the way, when publishers port their newspapers to the iPad, it won’t look like what you see above. The real digital newspapers will be essentially be elaborate websites made into a functional apps. The interface will be custom, and the content will be the same as the publication itself. See the Sports Illustrated tablet demo for more. When you eat a meal by yourself, do you read? I think most people nowadays will flip through a magazine, newspaper, or browse the web while eating alone. Imagine having an iPad propped up next to you with a digital magazine, or maybe a digital newspaper. Or perhaps you just want to check your favorite tech website, but don’t want to deal with the cumbersome form factor of a laptop (which is certainly not well-suited towards operation with one hand, as your other hand holds your sandwich). The slate-like form factor of the iPad makes it a terrific lunch companion, or lap computer, etc. It’s difficult to imagine how Need for Speed will work on the iPad, but it’ll feel as immersive as it does on the iPod Touch and iPhone, but will be bigger, and smoother, and more real. Imagine the closeness that you’ll have with a particular game by holding it in your hands. Again, it’s hard to imagine, because the closest comparison we have is playing PSP, Nintendo DS, or iPhone game. Many wonder if we need a “third” form factor. And I think we do. I think that we need a lifestyle computer to round off our computing experiences, something that is as natural to hold as magazine, but as immersive and dynamic as the internet itself. We haven’t yet had the technology to do a slate device that is thin, light, and inexpensive enough to see mass appeal, and coming April 3rd, we’ll finally have it.